Couldn't be easier, and all the better for being baked in a Dutch oven. Pre-heat oven to 450ºF, with cast iron dutch oven in it. Mix dry ingredients (I use an electric mixer with the dough hooks), add the buttermilk and mix until all the flour is combined. You might need to punch it around with your hands a bit at the end as the hooks tend to keep it broken. When the oven is at temperature, place dough in dutch oven, pressing down until it is a flattened disk about 2" high. Cut a deep cross in the top (very important, as without it the centre of the loaf will be thick and may not rise or cook properly). Bake with the lid on the dutch oven for 20 minutes. Then remove the lid, turn down the temperature to 400º and bake for 30 minutes without the lid on. 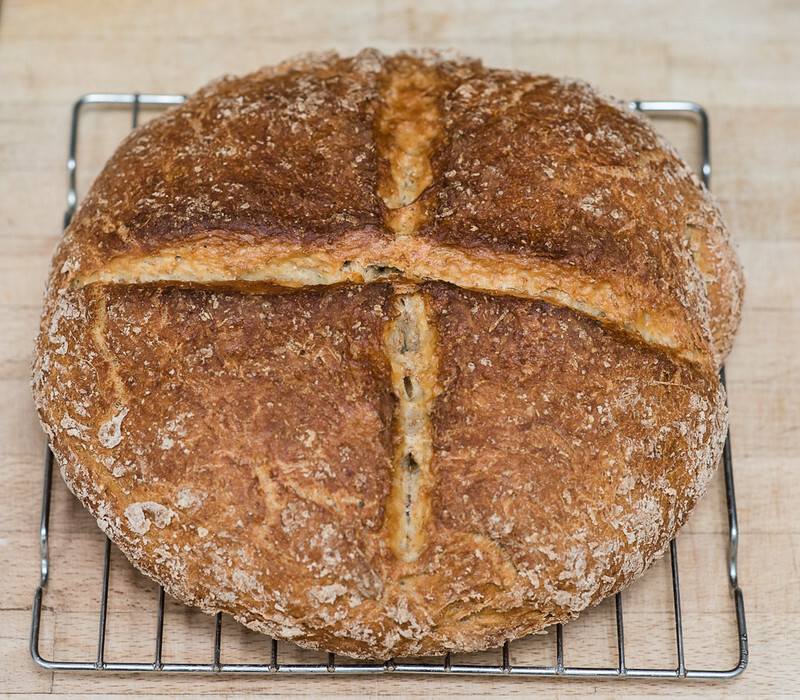 It's a bit more solid than a yeast-risen bread, but good all the same!